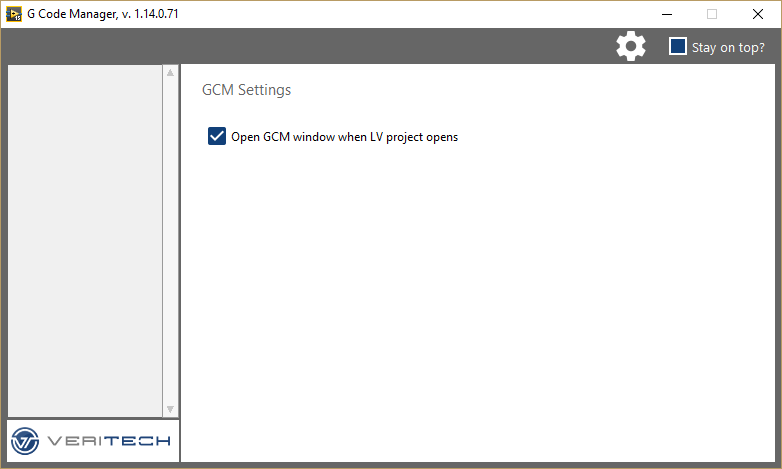 GCM is a tool that makes the properties of Project Items in Project Explorer window more accessible, removing unnecessary waiting times and modal windows. 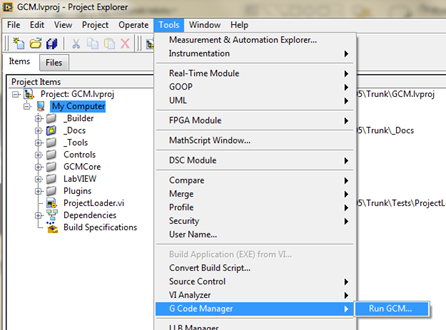 In runs in window next to the Project Explorer window and shows the items properties immediately after selecting new item in the explorer. GCM also allows you to create your own plugins to access those Project Items! 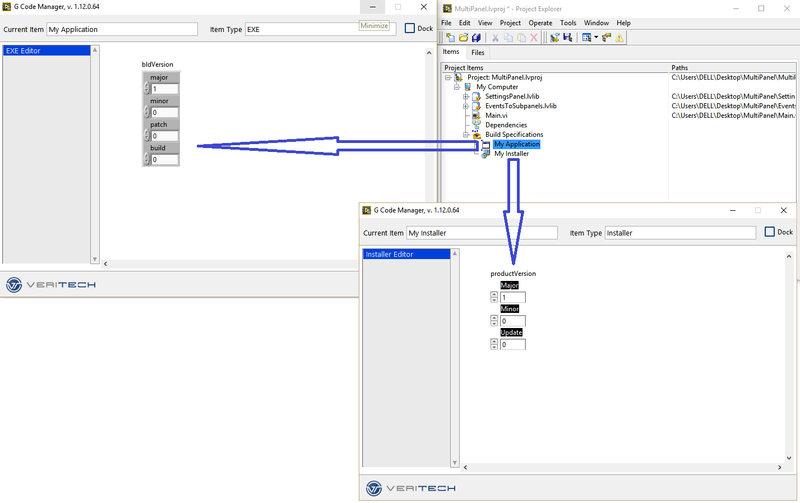 The package was built in LabVIEW 2014, it should also run in LabVIEW 2015. It may cause LV to crash! I strongly advise using source control - if you're not using one, do not even install this tool! (Above statements are really for your own good - I'm using this tool in my everyday work and I don't have any major issues. However, you might accidentaly clear your VI description or icon, or something like that, so be prepared for it by using source control like SVN or Git to revert the changes). - Icon Editor: Added "Default Font Settings" which sets the font to 8 pt, centered, capitalized. - Fixed the synchronization issue between plugins (icon edited in Icon Editor was not updated in Basic Documentation). 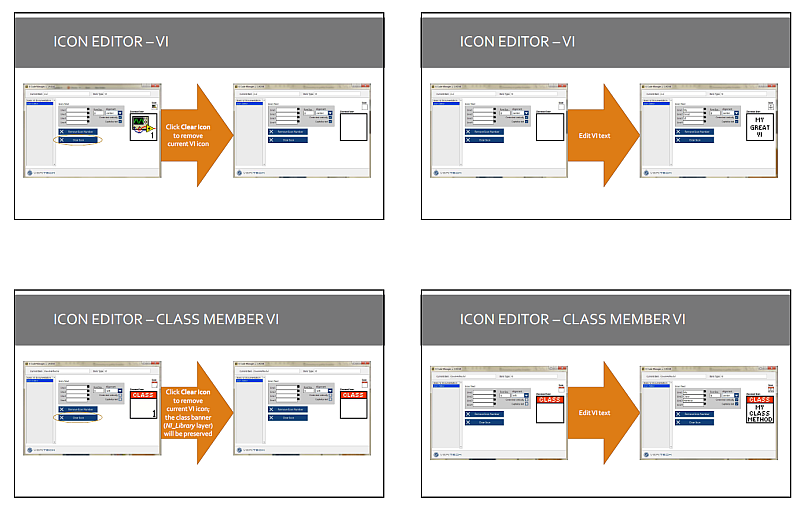 Any editions (VI/Class description, icons) might not save after the project is closed. 1. This looks great! Any attempt to reinvent the crusty LV IDE is fully supported here. 2. I was pleased to find this tool instead of another package manager when I clicked the link to this thread. Any reason you called it a "code manager"? 3. Are you actively developing it to address bugs like the one you posted today? Do you intend to invite community collaboration on the plugin framework? Hey, Stobber, thanks for the reply! 1. We've been using this tool for some time at Veritech and I finally got myself to show it to the Community - I also presented it at the European CLA Summit just before posting it. If you like it and you think that it can save just a little bit of your precious time - that's fantastic! 3. Yes and Yes. One of the main reasons I released it is that I want to get some good feedback to boost the developement. As for the community collaboration - I'm happy to hear any suggestions on any level, from bug reports and features requests to any architectural tips and minor tweaks somewhere deep in the code. 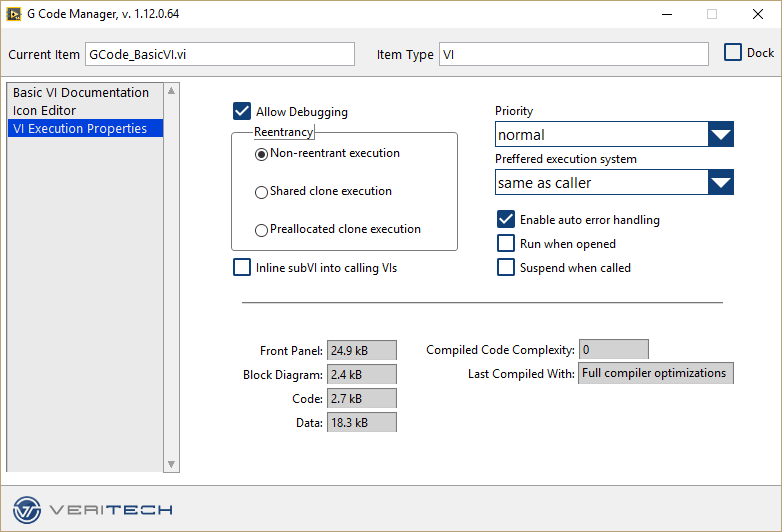 - you can open the main VI block diagram by pressing CTRL+SHIFT+E. - you can open any plugin BD by right-clicking on empty space in the plugin and selecting Open Block Diagram (this is subpanel). I'm using this quickly edit my class members, when I don't have time to create fancy icons with glyphs. You can always double-click on Icon to open native Icon Editor. At this moment I see 42 downloads of the first version, which is great But I'd love to see more feedback from you! If you have any comments, issues, propositions, requests, questions, or you just like it/don't like it, or you don't know how to use it, let me know by commenting here! New version 1.11.0 is added to the first post. In the v.1.10 there was synchronization issue between plugins - after editing the icon with Icon Editor plugin, it wasn't updated in Basic Documentation, and vice versa. This is fixed now by making some changes to the events that plugin receives. I'll probably review the communication with plugins a few more times, so if you're trying to develop your own plugin and run into any problems - please contact me. I've also updated the "Your own plugin" part in the documentation (now with fancy sequence diagram!). So, not many fireworks in this version, or at least the fireworks are hidden somewhere in block diagrams. Great work! I've been using this tool for a couple of months now. I'm looking forward to trying your next release. So far I've found it most useful for editing the inheritance and localized names of my classes. Hi Porter, I'm happy to hear that! Do you have any specific expectations for the next versions? Any features you'd like to see? Yes. I usually forget to set the version number correctly because it such a pain to get to. I realize afterwards and have to re-build my application. Remembering to version can be an issue, which is why I made a prebuild VI that runs which prompts you for the version. It also sets all installers to have the same version as the EXE you are setting, and I modified it so it sets the build number to the commit number in SVN. I have it on my feature list, +1 point for it. Easy - there is VI property "Inline Is Allowed", so if it will return false, I'll just disable Inline option. Yeah I like that property, but there are still a few instances where a VI could be inlined, but doing so would effect the code in some way the developer needs to be aware of. If you use the Call Chain primitive, then it will return one less level, if the VI is inlined. I only say this so that others are aware that turning on inlining for all VIs that can be inlined, is not always a good idea. The nice thing to do would be try to make each change and if the VI breaks (and wasn't broken before) you can undo it. Sorry to keep you waiting, but here it is: GCM 1.13.0 is available to download in the updated first post. 2. 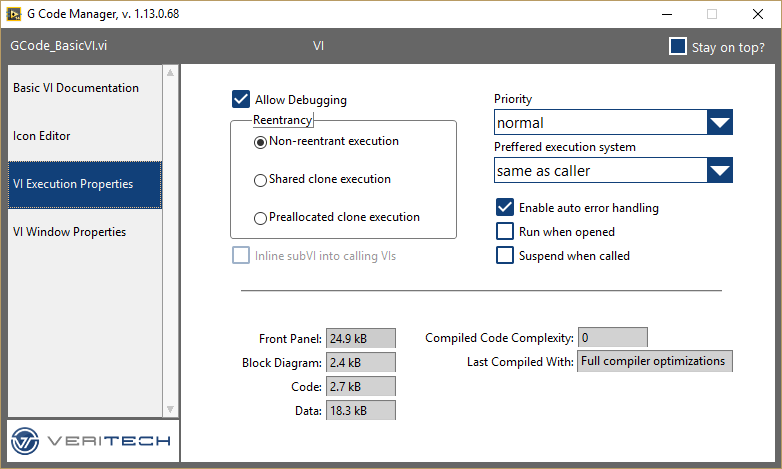 New VI Execution Properties plugin (might have some issues, please let me know if you find any). Thanks to Dawid for help. 3. 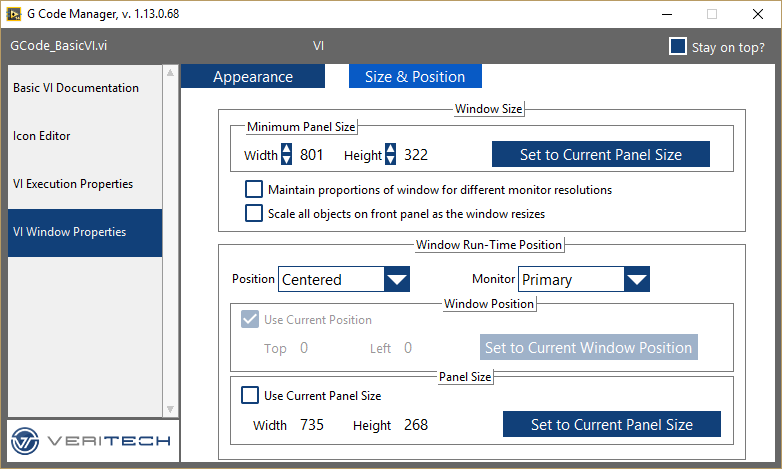 New VI Window Properties plugin (might have some issues, please let me know if you find any). Thanks to Dawid for help. 5. And global thanks to May for flat controls and general UI ideas. 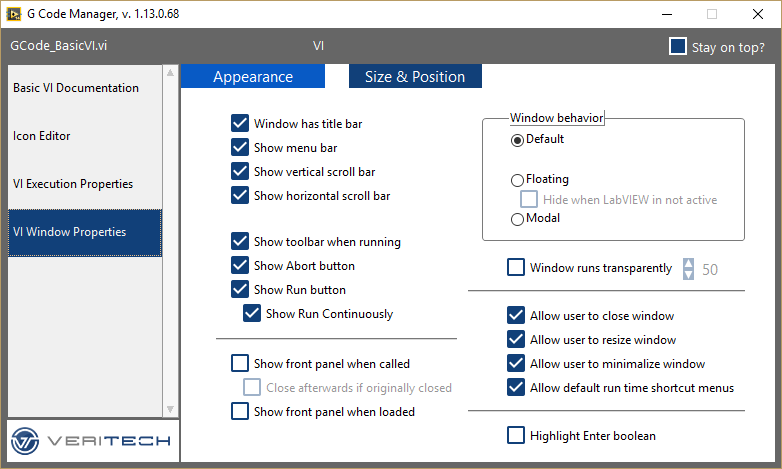 Also: here's the build specifications editor which I've mentioned. 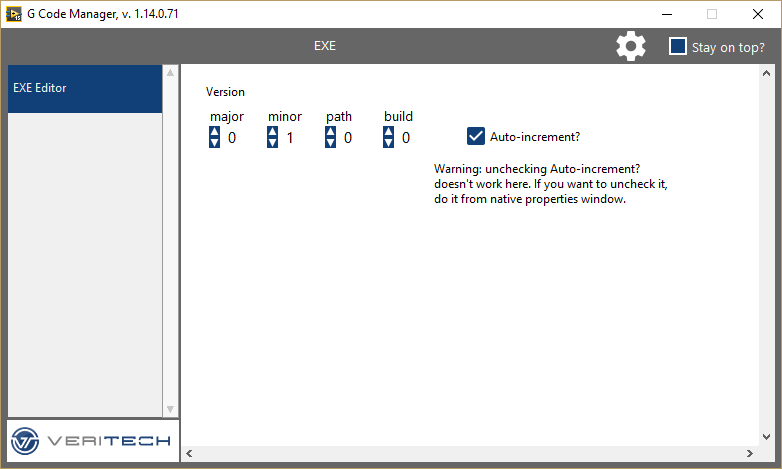 It works with exe and installer build specs and currently allows to change the version (with a little issue with Auto-increment option, described on the panel). Just download and install it, it should show up in GCM after installation. 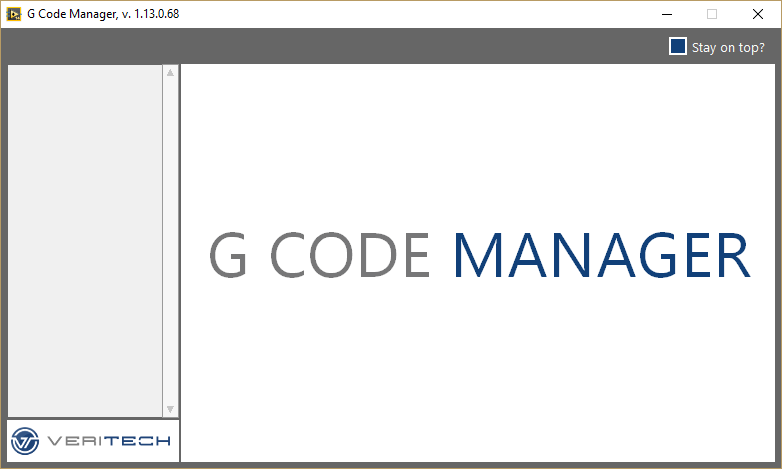 G Code Manager is now available at GitHub!